It’s been years since I wore a denim skirt of any kind. Most likely because I had my fair share of them in the late 90s. They were all long and some had buttons in the front, or a small slit on the side. Do these sound familiar? 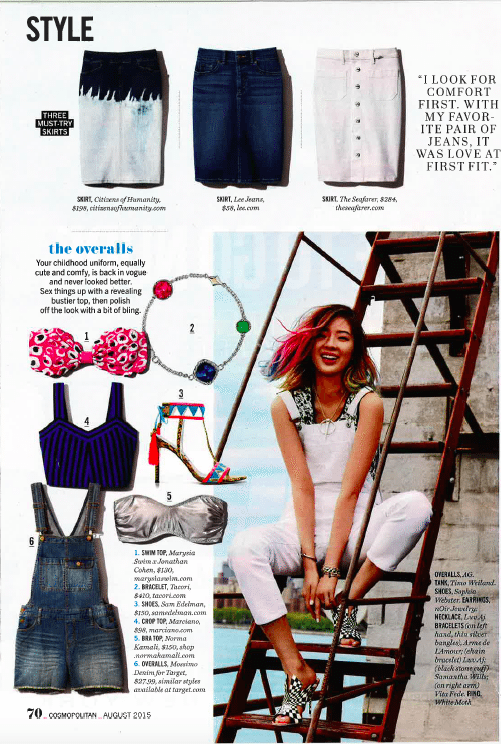 I’ve been hearing whispers the denim skirt is back on trend and in fact, the one I’m sharing with you today, graced the pages of Cosmopolitan Magazine for fall. The denim skirt is such a versatile article of clothing and as you’ll see, you can dress it up or down and create countless outfits. The Curvy Fit Stella Skirt is part of Lee Jeans Modern series and I am in love! It has just the right amount of stretch, a no-gap waistband that bends with you and was designed with our curves in mind. Here are four ways I styled it! This is definitely going to be a favorite outfit of mine this fall. This is the second time this blanket scarf and these fringe boots have graced Mom Fabulous. You can find out how to tie a blanket scarf as I’m wearing here. Paired with the skirt, it’s the perfect outfit for every day wear. 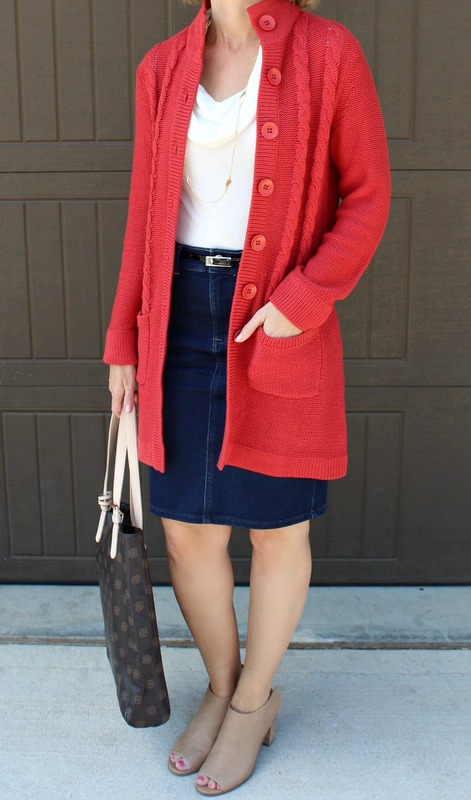 I always embrace the long cardigan in fall and winter. 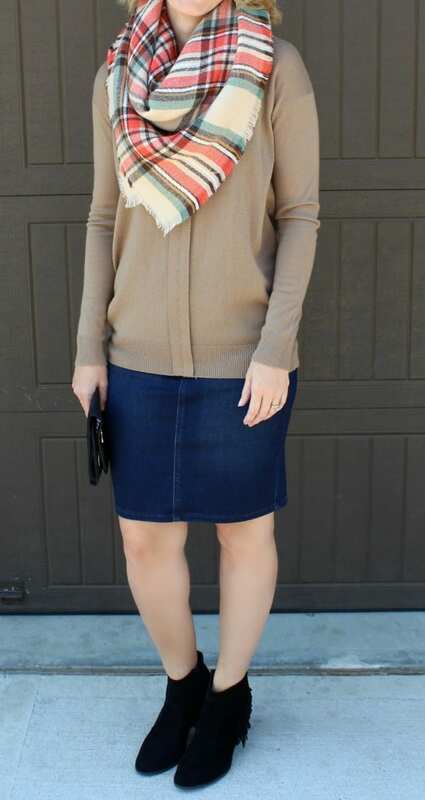 I love how you can wear it with jeans, leggings or like I did here – a skirt. This would also look cute with a black and white striped shirt underneath and the black fringe booties or flats. This is one of my favorite J. Jill pullovers from last season and it’s still available! 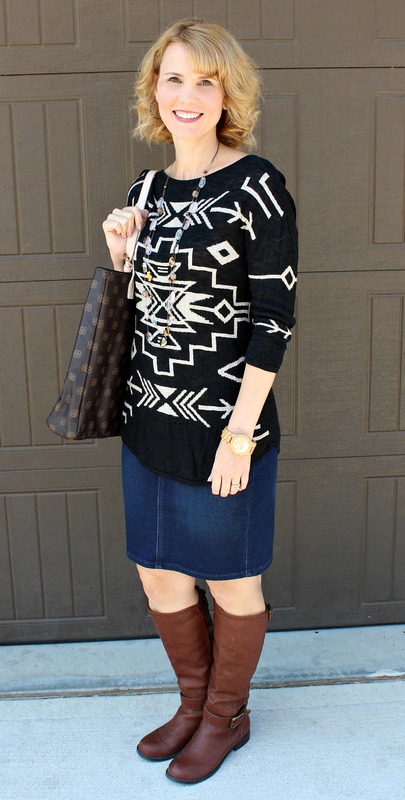 I’ve worn it with skinny jeans and my favorite wedges and now this denim skirt. It’s lightweight enough for early fall, which can still be quite warm where I live. This is a very simple, throw-on-and-go type of outfit. It doesn’t take a lot of thought and is incredibly comfortable. I feel like a million bucks in this outfit. It takes something as classic and comfortable as a denim skirt and kicks it up a notch. I purchased this shirt on my Burlington boho style shopping trip. It’s not boho, but I decided I had to have it anyway and would style it at a later date. It’s actually a pretty long shirt (from Larry Levine, but I can’t find the exact one to link to), but is lightweight enough to tuck in and not be bulky. It would also look fantastic with denim. So there you have it! Four ways to wear a denim skirt. Which one of these denim skirt outfit ideas was your favorite? And would you/do you wear them? Let me know! I’ll leave you with what I looked like in most of these pictures (that I didn’t show) because of the crazy Austin, Texas wind! Check out two of my friends who are styling the same skirt and look amazing! They are Andrea of Momma In Flip Flops and Ellen of That Chic Mom. Those are all super cute, I especially love it with that canyon pullover! It’s the perfect pullover for that in between summer/fall time. Thanks! Hi Julie, I am Ada. I co-hosted the Thursday Fashion Files yesterday. So glad I found your blog. I admire your chic and fabulous mom style. I have several denim skirts myself and plan on doing an entire week of outfits with them. Love your pencil one with the pretty aztec sweater and that amazing orange cardigan. I also love your black suede booties. I am wearing similar black booties on the blog today. Hi Ada! Thank you for stopping by and for co-hosting Thursday Fashion Files! I love all the looks, but outfit #1 is my fav! 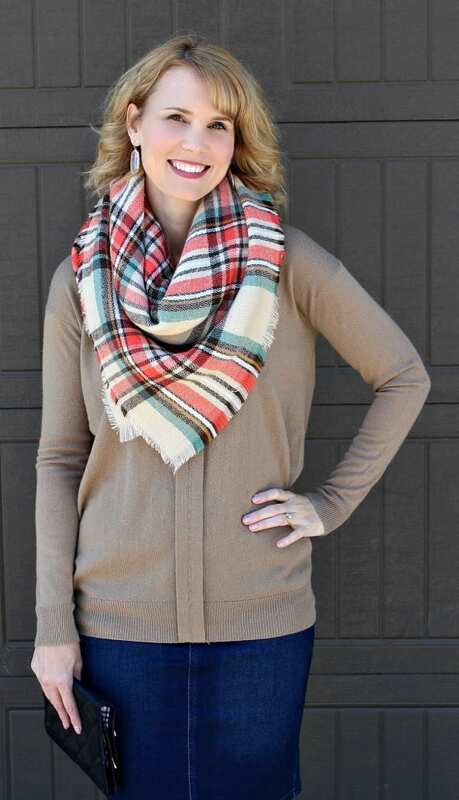 I am a big fan of plaid blanket scarves! Thank you Tamara! I have become a big fan of the blanket scarf this season. I can’t wait until the weather cooperates so I can wear it.